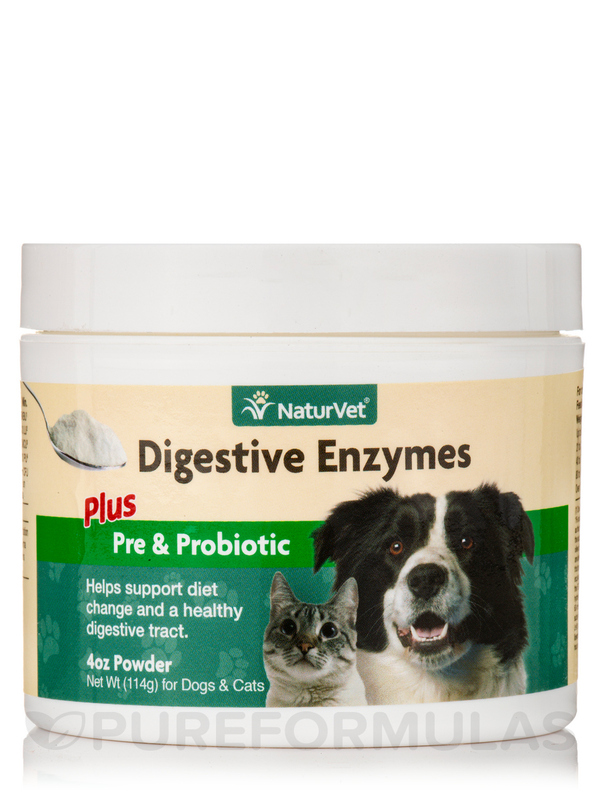 Gave this Digestive Enzymes Powder Plus Probiotic for Dogs & Cats by NaturVet to my cat 2X's per day when she got to be a "senior" kitty. Helped a great deal with her digestive issues. Helps support diet change and a healthy digestive tract! 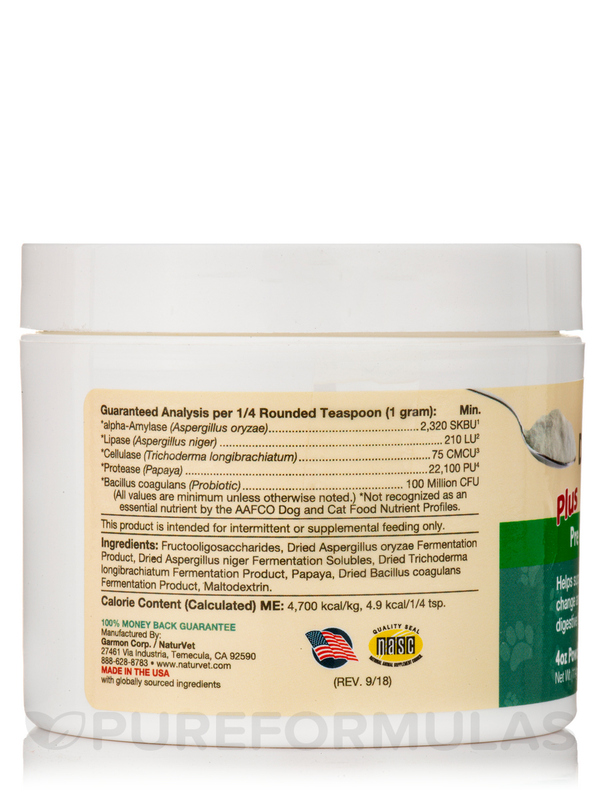 Guaranteed Analysis Per 1/4 Rounded Teaspoon (1 Gram): Min. Calorie Content: Metabolizable Energy (ME) as fed: 3‚893 kcal/kg (4.1 kcal/tsp). Ingredients: Fructooligosaccharides‚ Dried Aspergillus oryzae Fermentation Product‚ Dried Aspergillus niger Fermentation Solubles‚ Dried Trichoderma longibrachiatum Fermentation Product‚ Carica papaya‚ Dried Bacillus coagulans Fermentation Product‚ and Maltodextrin. 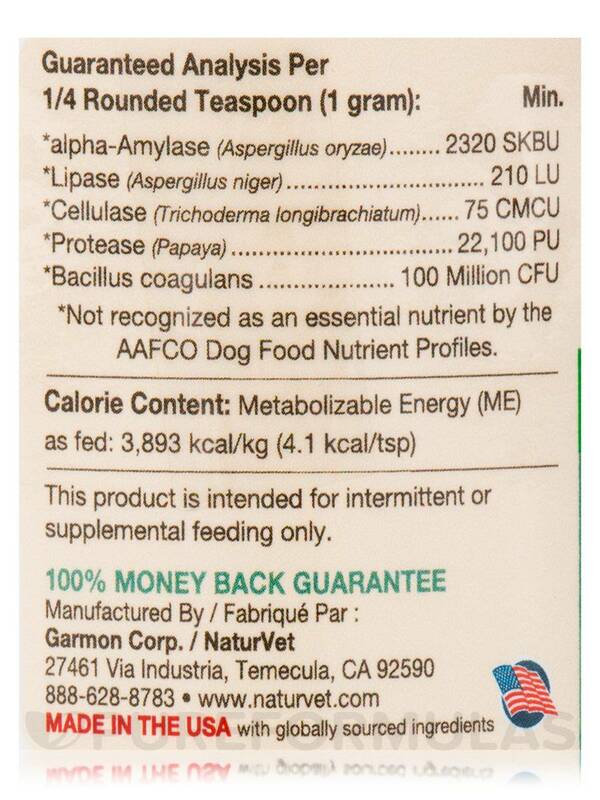 My dog's tummy was making such a fuss after eating, even after switching him to grain free food. He was so gassy and you could hear his stomach from another room. 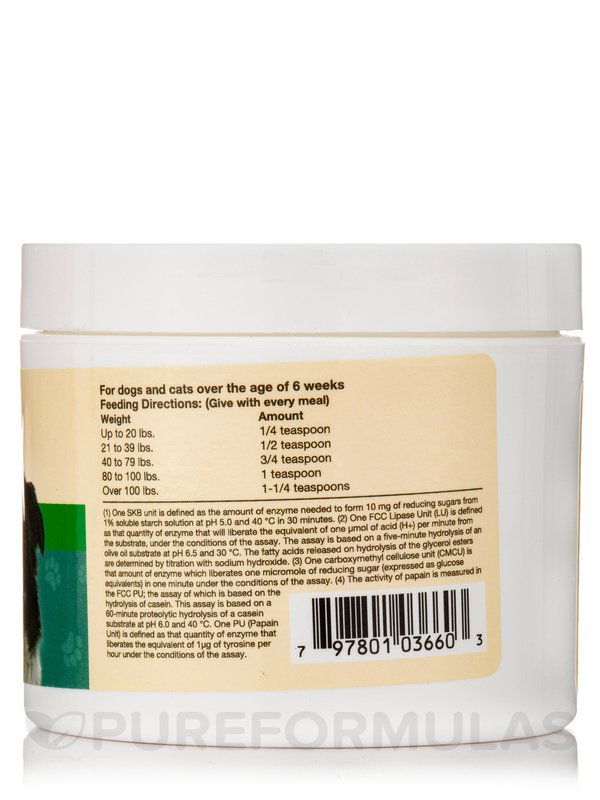 Once he was on the Digestive Enzymes Powder Plus Probiotic for Dogs & Cats - 4 oz (114 Grams ) for a few days, we noticed a significant improvement. No more noise or gas. 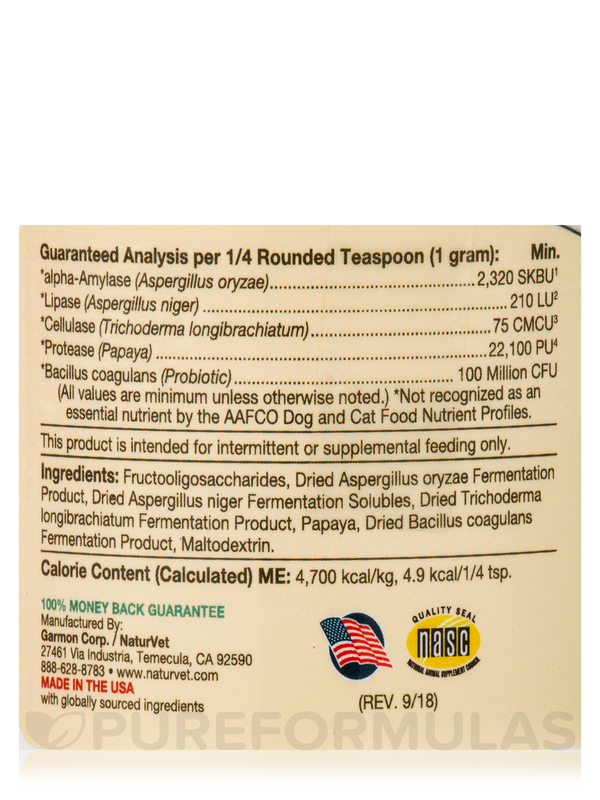 Plus Probiotic for Dogs & Cats by NaturVet really helped with my dog's intestinal issues. His tummy is much quieter and he's not gassy anymore. 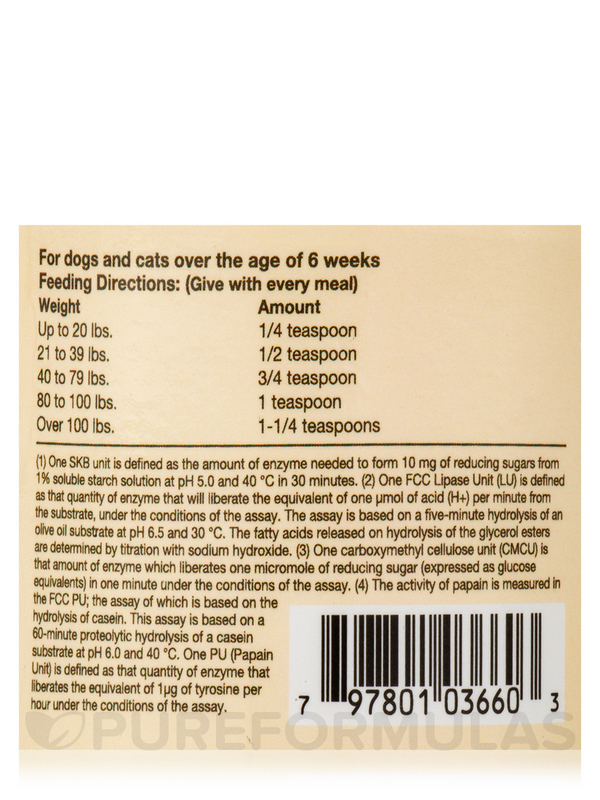 Had to start cooking for our hyper allergenic dog and Digestive Enzymes Powder Plus Probiotic for Dogs & Cats by NaturVet has definitely helped his body to be able to process his food with less allergic response post meal. He's less red. We added another product too and that really catapulted his relief! !